Successfully Added 9 Inch Widescreen Portable DVD Player with Copy Function to your Shopping Cart. The Portable Multimedia DVD Player with 9 Inch Widescreen + Copy Function lets you enjoy audio and video entertainment your way! DVD player, Analog TV, Photos in your home, car or anywhere you choose! Enjoy your favorite wide screen DVD's in 16:9 format and videos on the 270 degree swivel screen, which means you can rotate and adjust it any which way for maximum viewing comfort. This portable device is ideal for long flights and car rides. "Are we there yet?" no more! With the easy-to-use Portable Multimedia DVD Player, the journey is as enjoyable as the destination. It keeps kids and passengers entertained on the go so family trips are better than ever. This multimedia DVD player supports a wide range of disc types and file formats to let you play all your favorite media files. With a built-in USB and 3-in-1 card reader, all you need to do is plug in your SD/MMC/MS card or USB stick to instantly watch your own videos or listen to your own music. You can also take advantage of the AV IN port to play media files from other sources, like your camera or camcorder, or add this DVD player to your bedroom and use the AV OUT port to watch DVDs on your TV. Two more amazing value-adding features of this DVD player are the copy function and last memory function. Copy allows you to convert CD tracks into MP3 files and copy them onto your USB flash drive, which is THE fastest way to rip music from your favorite CD's. The last memory function means you can watch a DVD, turn the DVD player off to take a break, and then turn it on to continue from where you left off! While it may not sound like much on paper, you'll truly value these two functions once you have them. Wide compatibility of disc and file formats, a high quality display, last memory and copy function, remote controller plus full selection of buttons and ports, and an unbeatable price make this portable multimedia DVD player a guaranteed hit on your next trip. 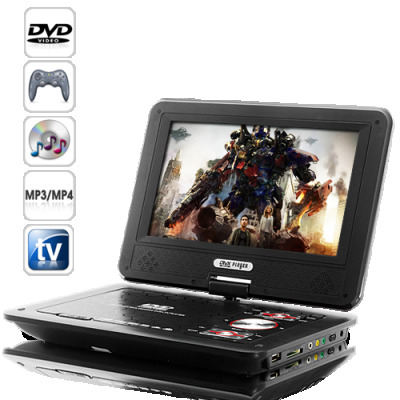 Order your new 9 Inch LCD Widescreen Portable DVD Player with Analog TV and Copy Function today! Resellers, this is sure to be a favorite with your customers, so stock up for your online shop and enjoy even more savings and bigger profit. From your best source of high quality, low price electronics, Chinavasion.